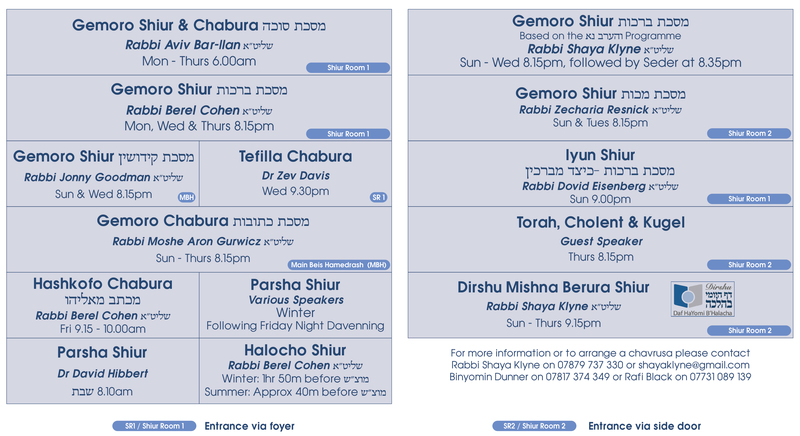 Ohr Yerushalayim hosts a wealth of Shiurim during the week and over Shabbos together with guest speakers over the Yomim Tovim. In addition, the Beis HaMedrash contains an extensive library of Seforim. Boruch HaShem as the Rov recently commented, there’s never a time from when the Shul is opened early morning to when it’s locked up late at night that at least someone isn’t learning in the Shul. Below is the current Shiurim schedule for the week.